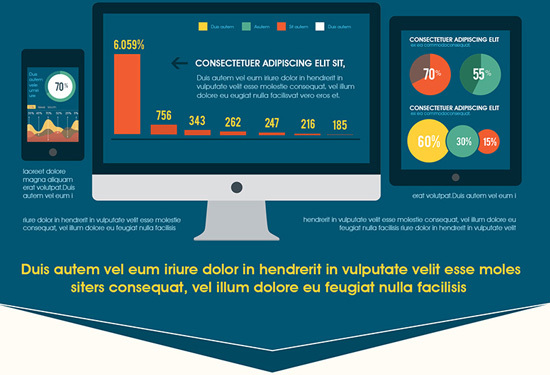 A free infographics PSD templates with a simplistic design for technology based research. This template has a beautiful circular diagram in the middle which can be used to present stats. The bottom section has vectors of percentage circles and a laptop. The top area has vectors of iPhone, iPad and Mac Monitor. Vector graphics have been used in this PSD template organized layers so you can easily edit it and quickly get it ready for work. 3 color versions are already, yet you can also customize the colors to your likings.